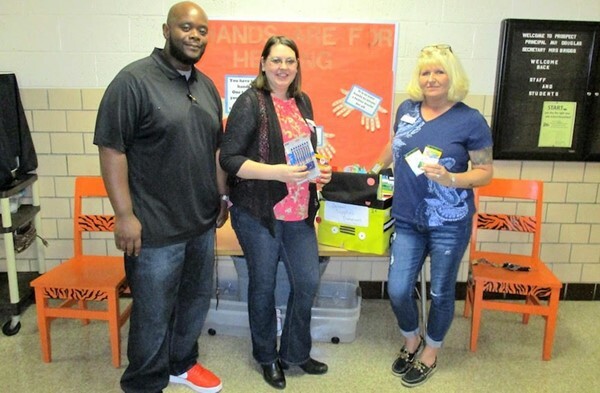 Prospect Elementary Principal Jason Douglas accepts school supplies donations from Jennifer Vance, left, and Rebecca Tyree of the staff at The Waterford at Mansfield. The Waterford at Mansfield has joined the list of civic groups, churches and other businesses who have donated school supplies to Mansfield City Schools students. A bulging collection of crayons, pencils, notebooks and other supplies, packaged in a large box decorated as a school bus, was delivered to Prospect Elementary School Friday morning. The supplies were presented to Principal Jason Douglas by Rebecca Tyree, activities director at the independent and assisted living facility, and Jennifer Vance, director of sales and marketing. “The Waterford staff and residents contributed supplies or the funds to buy them,” Tyree said. Douglas expressed Prospect’s thanks for the donation, then jokingly asked if he could keep the decorated box too.